If you’ve never heard of Vernors ginger ale, you’re probably not from Michigan. Founder James Vernor, a drugstore clerk in 1860s Detroit, created the recipe a very long time ago. According to a wonderfully romanticized legend, Vernor made the ginger ale, stored it in an oak cask and then left for the Civil War. Three years later, he came back, tried the result and loved it, declaring the flavor “deliciously different,” which remains the brand’s slogan. In truth, Vernor developed the oak-barrel-aged recipe after the war. Still, the old-timey soda seems like an odd fit for the next great Slurpee flavor. 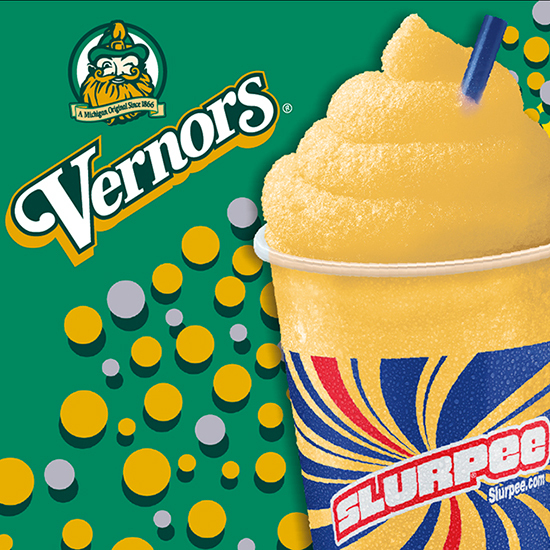 Proving that this isn’t your granddaddy’s Vernors, the company has partnered with 7-Eleven, and the special edition Vernors Slurpee is currently available at more than 200 locations in Michigan.